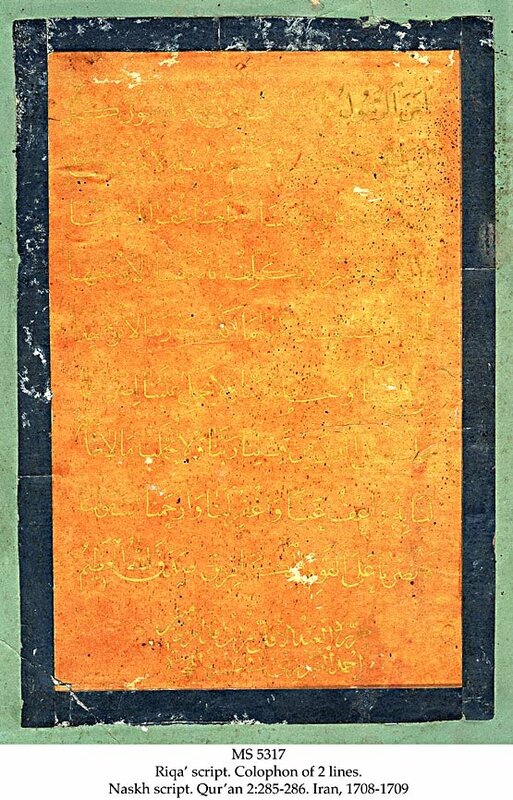 Description	 MS in Arabic on peach-coloured paper, Iran, 1708-09, 1 f., 33x21 cm, single column, (21x14 cm), 9 lines in Naskh script in gold, colophon of 2 lines in Riqa’ script in gold by Ahmad al-Nayrizi, autograph, signed. Provenance	 1. Ahmad al-Nayrizi, Iran (1708-09); 2. Sam Fogg, London. Commentary	 Ahmad al-Nayrizi was the most famous Persian scribe in the 18th c. He is credited with the increased popularity of Naskh in Persia at this time, where it was restricted to Arabic texts, the more flowing Nasta’liq used instead for Persian language. 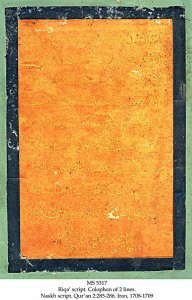 Riqa’ script is one of the 6 styles of major cursive writing originating in the 10th c. It should not be confused with the very late Riq’a or Ruq’a script, see MS 5314 from 1870.